Covering a total surface area of about three thousand square metres, this building occupies a whole insula (block) and is certainly one of the largest and most sumptuous houses in Pompeii. Its entrance lies in Via della Fortuna. The residence is of Samnite origin and was built in the early 2nd century B.C. in place of an older construction. It derives its name from the small bronze statue of a dancing faun (a copy of which is exhibited here) which decorates the impluvium of the Tuscan atrium. Nothing is known about its owners. From an architectural viewpoint this house is unique not only for its remarkable size, but also because it has two atria, two peristyles, four triclinia and a small bathing complex. Each of the two distinct parts of the house was arranged around an atrium of its own. The first part, which has a Tuscan atrium, is identified by the greeting “Have” which appears both in a mosaic on the pavement and on the 1st style decorations of the entrance hall. This was certainly the residential section of the house, while the other, laid out around a tetrastyle atrium, was where the servants lived and worked. Opposite the entrance to the residential section is a tablinum whose floor is decorated with a cube design in perspective. The skeleton of a woman carrying jewels and coins was found in this room and is assumed to have been the wealthy owner of the house. 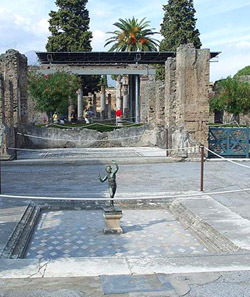 The house has two winter triclinia, one on either side of the tablinum, and a first peristyle with 27 stuccoed columns just behind the tablinum itself. Two column mark the entrance to the exedra in which the magnificent mosaic depicting a scene from the battle of Issus between Alexander the Great and King Darius of Persia was found. A corridor from one of the two summer triclinia which extend all round the exedra leads to a larger peristyle with 48 Doric columns. This has a lararium on the left and the door to the gardener’s lodgings on the right. A secondary entrance to the house from Vicolo di Mercurio also leads into this peristyle. In the servants’ quarter, which can be reached through separate doors from two shops, we can see a number of cubicula where the staff slept. The kitchen, the lavatory and the small private baths of the house opened onto a narrow passageway leading to the peristyle. The bath are composed of a tepidarium and a calidarium which used the heat generated by the hearth in the adjoining kitchen and both had slightly raised floors.